To boot an IBM System i or IBM System p system from a CD-ROM, you must specify the install boot device in the System Management Services (SMS) menu. To enter the System Management Services GUI, press the 1 key during the boot process when you hear the chime sound. This brings up a graphical interface similar to the one described in this section. 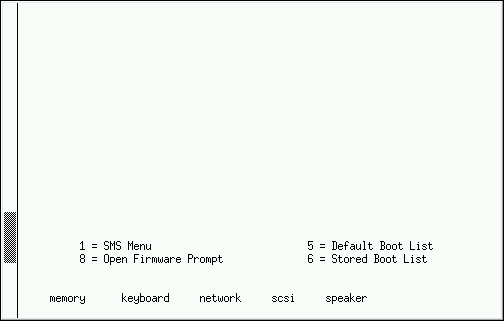 Once in the SMS menu, select the option for Select Boot Options. In that menu, specify Select Install or Boot a Device. There, select CD/DVD, and then the bus type (in most cases SCSI). If you are uncertain, you can select to view all devices. This scans all available buses for boot devices, including network adapters and hard drives. Finally, select the device containing the installation CD. YABOOT is loaded from this device and you are presented with a boot: prompt. Press Enter or wait for the timeout to expire for the installation to begin. If you are booting via the network, use the images/netboot/ppc64.img file on CD #1.